Participants in Nawalparasi Association of the Deaf’s first empowerment training workshop for women pose with a poster about their workshop. Sexism: discrimination toward women on the basis of their gender. And audism: discrimination toward deaf and hard of hearing people on the basis of their hearing status. These are just two of the many challenges that Deaf women face in Nepal. But they are ready to lead the way in defeating these challenges and creating social change. 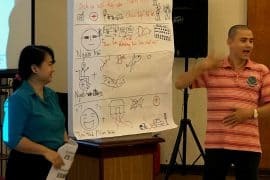 Mill Neck International (MNI) has been supporting five Deaf organizations around the world in implementing various projects. These projects include training Deaf leaders, gathering data and statistics about Deaf people in their country, and more. MNI provides funding support as well as training for local project coordinators. In Nepal, a country nestled in the Himalayan mountains north of India, MNI’s partner organization is Nawalparasi Association of the Deaf (NAD). Their project is to prepare Deaf Nepali women to engage in the social, cultural, and economic development of their country. 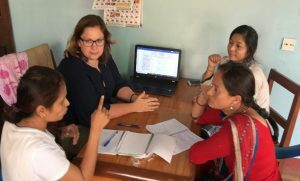 In late September and early October, MNI sent Sarah Houge, its Planning Monitoring and Evaluation Specialist, to Nepal. She observed and assisted as NAD provided their first four-day empowerment training workshop for Deaf women. The participants were so eager that 35 out of 30 women attended–five more than originally planned. And some of them arrived hours early, before the trainers came. 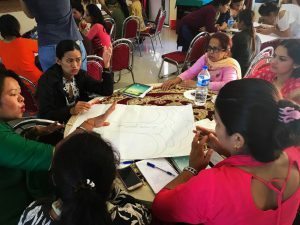 During the Deaf women’s empowerment training workshop, women needed to complete a “Problem Tree” to identify the root causes and the effects of a problem they confront in society. Participants didn’t confine their enthusiasm to the official training activities. Most of the women were together in the same resort for four days. They used their time outside of training to talk about what they had learned. When they initially struggled with one activity in the workshop, they had tea brought to their table so they could work through their tea break. They had a breakthrough in understanding how to develop a Problem Tree. A Problem Tree is used to trace the root causes of a problem, to show its effects, and to identify potential solutions. They enjoyed the opportunity to succeed at a challenging task. The participants asked questions throughout the workshop, wanting to know how to design projects they could implement in their local communities. NAD had not initially meant to provide training on project design. But because participants are interested, NAD has now added this component to plans for the second phase of their project. Sarah Houge meets with representatives of the Nawalparasi Association of the Deaf. In addition to observing NAD’s first Deaf women’s empowerment workshop, Sarah Houge provided additional training to NAD’s project coordinators and board members. This was during the days before and after the empowerment training workshop. She trained them in topics such as monitoring and evaluation, the role of board members within an organization, and tools they can use in future board meetings. Together, they documented and evaluated the empowerment training workshop. The organization will be using this information when they write its monitoring report. She also supported them in analyzing difficulties they faced as an organization and their discussions about how they would resolve them. She helped equip them with skills that will help, not only with implementing their current project, but also with future projects after MNI’s funding ends.